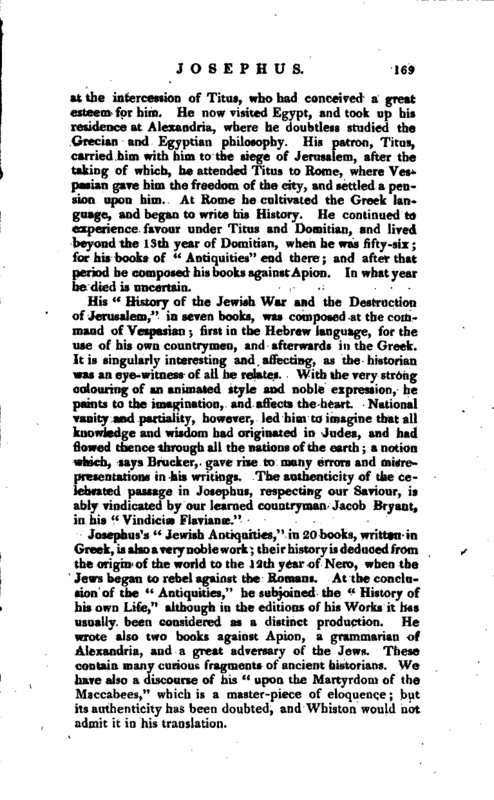 , the celebrated historian of the Jews, was born at Jerusalem, of parents who belonged to the illustrious Asmonean family, about the year 37. He soon discovered great acuteness and penetration, and made so quick a progress in the learning of the Jews, that he was occasionally consulted by the chief priests and rulers of the city, even at the age of sixteen. For the purpose of studying the history and tenets of the several Jewish sects, he became for three years a pupil of Banun, a hermit, who had acquired great fame for wisdom; and with him lived a recluse and abstemious life. After this he became of the sect of the Pharisees, of which he was a very great ornament. 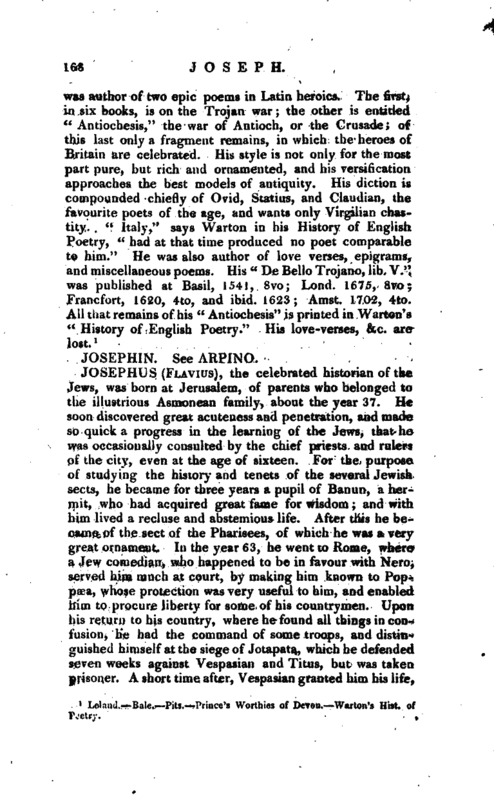 In the year 63, he went to Rome, where a Jew comedian, who happened to be in favour with Nero, served him much at court, by making him known to Poppaea, whose protection was very useful to him, and enabled him to procure liberty for some of his countrymen. Upon his return to his country, where he found all things in confusion, he had the command of some troops, and distinguished himself at the siege of Jotapata, which he defended seven weeks against Vespasian and Titus, but was taken prisoner. A short time after, Vespasian granted him his life, | at the intercession of Titus, who had conceived a great esteem for him. He now visited Egypt, and took up his residence at Alexandria, where he doubtless studied the Grecian and Egyptian philosophy. His patron, Titus, carried him with him to the siege of Jerusalem, after the taking of which, he attended Titus to Rome, where Vespasian gave him the freedom of the city, and settled a pension upon him. At Rome he cultivated the Greek Ian* guage, and began to write his History. 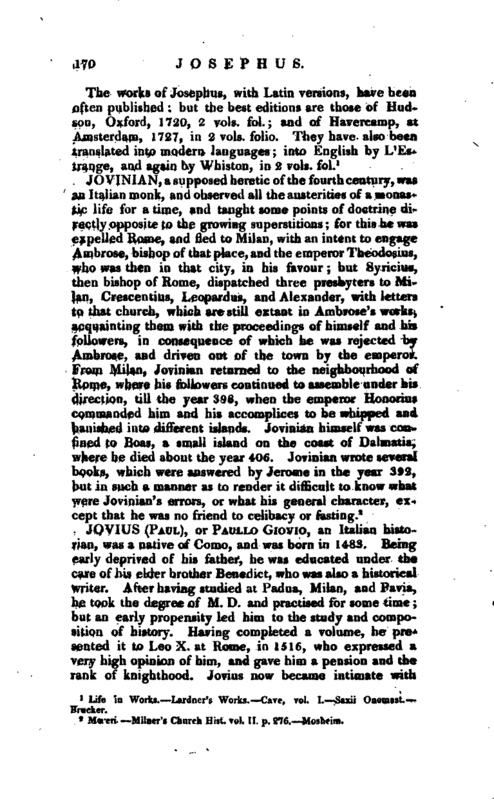 He continued ta experience favour under Titus and Domitian, and lived beyond the 13th year of Domitian, when he was fifty-six for his books of “Antiquities” end there and after that period he composed his books against Apion. In what year he died is uncertain. Life in Worki.- Lardner’s Works. Cave, vol. I. —Saxii Onomast. Brocket.